MANILA, Philippines – Lakas-Kampi-CMD presidential bet Gilberto Teodoro has resigned as chairman of the administration party. Teodoro said his resignation takes effect immediately so he can focus on his campaign. “Effective immediately, I am resigning as chairman of the party so that I can focus all my efforts campaigning for the presidency,” he said in his letter to the party’s national executive committee. Teodoro noted the party needs a chairman who can respond on a 24/7 basis to the needs of its candidates. However, Teodoro said he remains a member of the ruling party and its “official” presidential bet. In an interview with Ces Drilon on ANC’s Rundown on Tuesday, Teodoro said his decision to leave the party should not be seen as a step toward withdrawing from the presidential race. “Definitely, I’m pursuing my candidacy,” he said. The former defense chief said the move was necessary so he can “devote full-time to his candidacy” as he attempts to win the presidency. After the local campaigns began March 26, Teodoro said he realized that he should not be distracted by the concerns of the party’s 18,000 other candidates. “It’s a step I took to ensure that I give my best possible shot at the presidency,” he added. Francis Manglapus, secretary-general of Lakas-Kampi-CMD, said Teodoro had previously discussed the issue of leaving the party’s top post. Manglapus said it would be better for the party to have a full-time chairman since Teodoro is too busy hopping from one place to another. He said it would be up to the Lakas-Kampi-CMD national executive committee to choose the next party chief. MANILA, Philippines—While Malacañang was not looking, Nacionalista Party NP presidential candidate Sen. Manuel Villar has quietly gained the support of the biggest political party and the most powerful political family in vote-rich Cebu, according to well-placed party sources.Villar met with congressmen and local officials belonging to One Cebu and the Garcia family behind closed doors at Marco Polo Hotel in Cebu City on Wednesday.Although details of the meeting were not disclosed to local journalists, Alvin Garcia, who is seeking to regain the city’s mayoral post, announced an alliance between his party, Kugi Uswag Sugbo Progress for Cebu or Kusug, and the NP in a press conference at the same hotel. MANILA, Philippines – Supporters of Lakas-Kampi-CMD standard-bearer Gilbert Teodoro Jr. launched yesterday a new movement for a people-based network to generate votes for their candidate. Lead convenor Eli Quinto said the Gibo Multipliers Movement was formed to consolidate, coordinate and multiply individuals and groups supporting Teodoro. “At the heart of the (movement) is the idea that a single person or group is connected to others who, in turn, have their own respective connections,” he said. MANILA, Philippines – Administration presidential candidate Gilberto “Gibo” Teodoro on Wednesday defended Pampanga Rep. Juan Miguel “Mikey” Arroyo’s bid as party-list representative. “Is it legal or not? It’s legal. Wala tayong magagawa (We can’t do anything about it),” Teodoro said when asked to comment about criticisms against Arroyo’s nomination as representative of Ang Galing Pinoy, a party-list group representing security guards. The Lakas-Kampi-CMD standard-bearer said that what the next administration and the next set of lawmakers can do is to revise the party-list law to fix the “flawed” system. MANILA, Philippines – Despite the controversy over government-backed party-list groups, there is no reason to disqualify Pampanga Rep. Juan Miguel “Mikey” Arroyo from the party-list race, the Commission on Elections (Comelec) said yesterday. Comelec Chairman Jose Melo said President Arroyo’s eldest son has served as a representative in Congress and is competent to become a nominee of the party-list group Ang Galing Pinoy (AGP). “He (Arroyo) is qualified to be a member of Congress,” Melo said, noting that his decision to give way to his mother in the congressional race in the second district of Pampanga could not be a basis for disqualification. AND: Comelec can’t stop GMA legacy ads. ELECTION officials obviously just don’t get it. They say that as long as people vote, there can be no failure of elections. The ballots cast physically exist. In case all precinct count and optical scan machines conk out, election inspectors can read the ballots by eye and total the votes manually. In case radio transmission fails, the results can be delivered physically to tabulation centers. TO BE SURE THE METROPOLITAN MANILA Development Authority these days seems to be more focused on traffic management rather than experimentation. We have observed a commendable zeal in enforcing traffic rules and regulations. On the other hand, the change in regimes from the time Bayani Fernando left the administration has revealed the manner in which the agency is a political tool. MANILA, Philippines – Former defense chief and Lakas-Kampi-CMD presidential candidate Gilberto “Gibo” Teodoro took his campaign sortie yesterday to Marikina City, the bailiwick of former Metropolitan Manila Development Authority (MMDA) chairman Bayani Fernando, who bolted the administration party after Teodoro defeated him in the party’s presidential nomination late last year. Teodoro, whose late grandfather is from Marikina, was welcomed by mayoralty bet Dr. Alfredo Cheng and other local candidates. MANILA, Philippines – Nacionalista Party (NP) standard-bearer Manuel Villar Jr. yesterday called for the strict monitoring of the implementation of human rights policies adopted by the government and treaties ratified by the Philippines. “If we are serious in dealing with extra-judicial killings in the country, we must raise the awareness that the Philippines absolutely adheres to the highest standards of protecting the people’s rights at all times,” Villar said. “For me, it’s simple: The people already know that Arroyo is corrupt, why would they accept the appointment by Ms Arroyo? For me, they’re already suspect,” the independent candidate said Tuesday. “In general, all appointees of Ms Arroyo will be gone. I will appoint a whole new set of people,” he said. On Tuesday, Valenzuela 1st District Rep. Rex Gatchalian, spokesman of the Nationalist People’s Coalition (NPC), claimed that many supporters of vice-presidential candidate Loren Legarda were unable to log on to the Harapan live chatpage just minutes before the debate started. Gatchalian, who blogged for Legarda in the Harapan chat, said he also noticed that supporters of a rival candidate seemed to have infiltrated the chat early on and posted black propaganda about Legarda. Click ABS-CBN News Online Beta. MANILA, Philippines – This early, Lakas-Kampi-CMD standard-bearers Gilbert Teodoro and Edu Manzano are begging off from the first ever tandem debates among presidential and vice-presidential candidates aired live nationwide on Sunday. In a statement, Teodoro said he has already saturated forums and debates and now needs to concentrate on doing campaign sorties in the provinces. He said the start of the campaign period for local candidates could boost his campaign as he joins local bets of Lakas-Kampi-CMD. JUSKOLORD! Nadaya na naman si Ms. Lipitor pati sa VP debate?!?! NPC should really get a new scriptwriter. MANILA, Philippines – In what could turn the tide in favor of former defense secretary Gilbert Teodoro, 51 of the country’s 82 governors have formed a multi-party alliance and pledged to deliver “the highest possible number of votes” for the administration candidate in the May elections. Signing a manifesto of support they adopted last week, the governors from the League of Provinces of the Philippines (LPP) said their decision to support Teodoro was reached after thorough review of all the presidential candidates’ platforms of government, track record, and qualifications. “Having completed our review, our candidate for President has to be ‘Gibo’ Teodoro and no other, and for whom we hereby commit ourselves to campaigning nationwide, among our local constituencies – our vice-governors, our board members, mayors, vice-mayors, councilors, barangay (village) captains and other local leaders— with the view to delivering to him the highest possible number of votes in our local areas,” they said in a joint manifesto. MANILA, Philippines—Administration standard-bearer Gilbert Teodoro expressed no surprise on Tuesday at Bukidnon Governor Jose Ma. Zubiri’s defection to the camp of rival Senator Manuel Villar, Jr.
“At the start he was already wavering, so we expected that.… He has been blowing hot and cold,” Teodoro told reporters after speaking to a crowd of youth supporters in Barangay Calumpang in Marikina City. 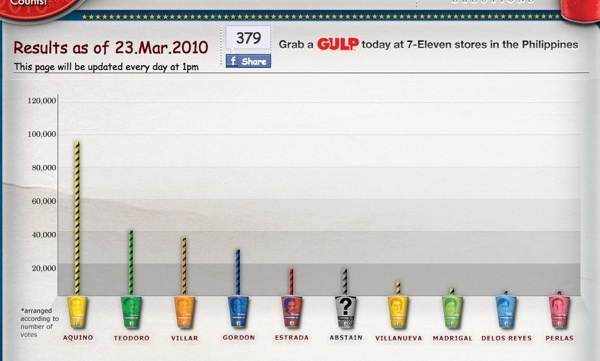 SEN. Noynoy Aquino leads the informal polls (Every Gulp Counts) of 7-11 stores nationwide. One new development is newly appointed Armed Forces of the Philippines Chief of Staff Gen. Delfin Bangit dropping in on Philippine National Police Director General Jesus Verzosa for a fireside chat, such as fireside chats can be pleasant in these sweltering days. As an AFP spokesperson put it, if Mohammed won’t go to the mountain, the mountain will come to Mohammed. An inspired metaphor only in that Verzosa can prove to be prophetic and Bangit a real mountain when the time comes, an immovable obstacle to a tide of protest. Verzosa of course has denied that Arroyo snubbed their rites in reaction to his statement that he would oppose any move to extend her term, but the fact remains that Arroyo wasn’t there. She apparently had more important things to do. That alone is proof of it. Like a stealthy army preparing to launch a major offensive, the ruling administration coalition Lakas-Kampi-CMD is moving heaven and earth at the grassroots to save the lagging presidential candidacy of former Defense Secretary Gilberto Teodoro Jr. The question that perplexes many party leaders is: Considering that Teodoro is running behind, why move only now?The ruling coalition, which enjoys a headlock on 70 percent of local government positions, is pinning its hopes on superior resources and widespread party machinery to swing the tide of battle. MANILA, Philippines—Senator Consuelo “Jamby” Madrigal is the most “green beans” among the presidential aspirants, various environmental groups said. Following Madrigal, other leaders considered as green beans or pro-people and pro-environment are Nicanor “Nicky” Perlas and Senator Manny Villar. The most mean beans or the least pro-people and pro-environment, meanwhile, is Senator Richard Gordon, followed by former president Joseph Estrada and former defense secretary Gilbert “Gibo” Teodoro. The question that perplexes many party leaders is: Considering that Teodoro is running behind, why move only now? The ruling coalition, which enjoys a headlock on 70 percent of local government positions, is pinning its hopes on superior resources and widespread party machinery to swing the tide of battle. SAN JOSE, Occidental Mindoro, Philippines – Administration presidential candidate Gilberto “Gibo” Teodoro and his team made their presence felt by campaigning in rebel-infested areas here. Teodoro, along with vice presidential candidate Edu Manzano, led the entourage in defying threats by the communist New People’s Army (NPA) in areas where just a few weeks ago 11 government troops were killed in an ambush staged by the rebel group. A yellow streamer of [Noynoy] Aquino’s was displayed in a space Biazon was renting in Metropolis, a mall owned by [Manny] Villar. The senator (Biazon) said mall personnel not only took down the yellow streamer bearing the tandem of Aquino and running mate Sen. Mar Roxas, his staff was also kicked out of the premises. Mall personnel also removed the yellow ribbons and flowers adorning the space of Biazon’s next door neighbor and replaced them with decorations in orange—the campaign color of Villar. [Manny] Villar said he would allow the wheels of justice to run their course if he becomes president and would look into the issue of land distribution after the Comprehensive Agrarian Reform Program (CARP) under the administration of Aquino’s mother, former President Corazon Aquino, failed in their family-owned Hacienda Luisita. Legarda, on the other hand, said that those who have committed crimes and human rights violations in connection with the massacre should be brought to court. Six of nine Philippine presidential candidates may face disqualification after their campaign materials have reportedly exceeded size limits and were allegedly posted in areas where these are disallowed. Several campaign materials of Senator Benigno Simeon “Noynoy” Aquino III (Liberal Party), former president Joseph M. Ejercito Estrada (Puwersa ng Masang Pilipino-UNO), Senator Richard J. Gordon (Bagumbayan), Gilberto C. Teodoro Jr. (Lakas-Kampi-CMD), evangelist Eddie C. Villanueva (Bangon Pilipinas), and Senator Manuel Villar Jr. (Nacionalista Party) seem to violate campaign regulations, a Commission on Elections (Comelec) spokesperson told reporters. SAGAY CITY, Negros Occidental, Philippines – Nacionalista Party (NP) standard-bearer Sen. Manuel Villar Jr., who reportedly has spent the most in the ongoing campaign, is protesting the government’s tax collection on campaign spending. The Bureau of Internal Revenue (BIR), which is carrying out the collection of the tax, has indicated that it would most likely miss its target collection of P1.2 billion for this May’s elections. Villar said he could not see how the BIR can talk about missing its target when the basis for the collection of the campaign tax is questionable. ONE had a sore throat and confessed to needing more hours of sleep, aside from being overweight. Otherwise, he said, he had no major health problems, pointing to his personal doctor in the audience. The other admitted that he had inherited so many things from his parents, “including hypertension and high blood sugar.” He also confessed to having a gall bladder problem which he planned to do something about after the campaign. So perhaps it wasn’t health problems that drew “presidentiables” Sen. Richard Gordon and former Defense Secretary Gilbert Teodoro to the forum on health sponsored by the Philippine College of Physicians. Maybe it really was, as former Health Secretary Alran Bengzon said, that they placed a high priority on health, an issue that has received far less importance or attention than it deserves. In a separate emailed statement, the senator said he never blamed Marcos&apos; children for the assassination of his father. Aquino also noted that when Imee was one of his colleagues at the House of Representatives, she helped him implement a hybrid rice program for his constituents.